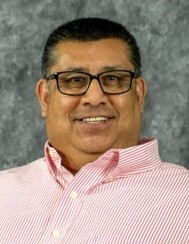 Ernest Garza, age 53, of Goodland passed away Friday, December 7, 2018. He was born May 16, 1965 to Ray C. and Maria S. (Salas) Garza in Tulia, Texas. Ernest attended school in Scotts Bluff, Nebraska and in Goodland and graduated in 1985. He enjoyed playing bingo, reading books, cheering on the Dallas Cowboys and spending time with his family. Preceding him in death are his mother, Maria and his grandparents. He is survived by his brothers: Mario Garza of Kansas City, MO; Roy Garza of Lincoln, NE; Jessie Garza of Salt Lake City, UT. Sisters: Lisa Garza of Burlington, CO; Virginia Salinas of Lohn, TX; Samantha Garza of Amarillo, TX; and many nieces and nephews. Funeral service will be Wednesday, December 12, 2018 at 3 p.m. MT at the Church of Christ, 1630 Sandy Drive, Goodland. Interment will follow the service at the Goodland Cemetery, North Main Street. Visitation will be prior to the funeral service at the Church of Christ on Wednesday, December 12, 2018 beginning at 1 p.m. MT.